New to Revolution and not sure where to begin? Commit to spending 3 weeks with us, pay only $33, and watch yourself begin to shift. Steady and consistent practice is the way of the Yogi(ni), and numerous studies show that it takes 3 weeks (21 days) to form a conscious, mindful habit. The start of Spring is a time for shift and deep transformation, and we're here to help on your journey to personal evolution. Unlimited yoga classes for 3 weeks! This offer is a one time purchase and is only available to local residents of the Savannah area. Can be purchased online, in studio or over the phone. Check out our Promotional Offer page for full details! Practice with us regularly - at least once a week? If you answered “yes!” than it’s time to #jointherevolution! We have 3 membership options, each created to align with your budget, schedule, and desired lifestyle. Military Members receive 10% off any of the below Membership options - valid ID required! Each of the below options has a 6-month commitment period, then rolls into a month-to-month contract after your initial term. Each also has loads of perks, so check out what we have going on and reach out to us with any questions (ashley@revolutionyogastudio.com). Best option for Yogi(ni)’s who practice 3+ days/week! If you practice with us regularly (3 days/week), this is the best option for you, as it drops the class cost down to $8.25! This membership includes: unlimited yoga, discounted in-house workshops (15%), discounted retail (10%), 3 free guest passes per quarter & discounted massage with Summer Foster! Please read our full terms and conditions. Best option for Yogi(ni)’s who practice 2-3 days/week! If you practice with us frequently (2-3 days/week) this is the best option for you, as it drops the class cost down to $9.45! This membership includes: 9 classes/month, discounted in-house workshops (10%), discounted retail (10%), 2 free guest passes per quarter & discounted massage with Summer Foster! Please read our full terms and conditions. Best option for Yogi(ni)s who practice 1-2 days/week! If you practice with us on a weekly basis (1-2 days/week) this is the best option for you, as it drops the class cost down to $13! This membership includes: 5 classes/month, discounted in-house workshops (5%), discounted retail (10%), 1 free guest pass per quarter & discounted massage with Summer Foster! Please read our full terms and conditions. not ready to commit? we’ve got you! Best option for Yogi(ni)s who practice 3+ days a week but do not want a contract! Best option for Yogi(ni)s who randomly pop in to class from time to time! Best option for Yogi(ni)s who are visiting Savannah or only able to pop in for 1 class! This contract free auto-renewing monthly package is perfect for those who practice with us 3 days/week but don’t want to commit. 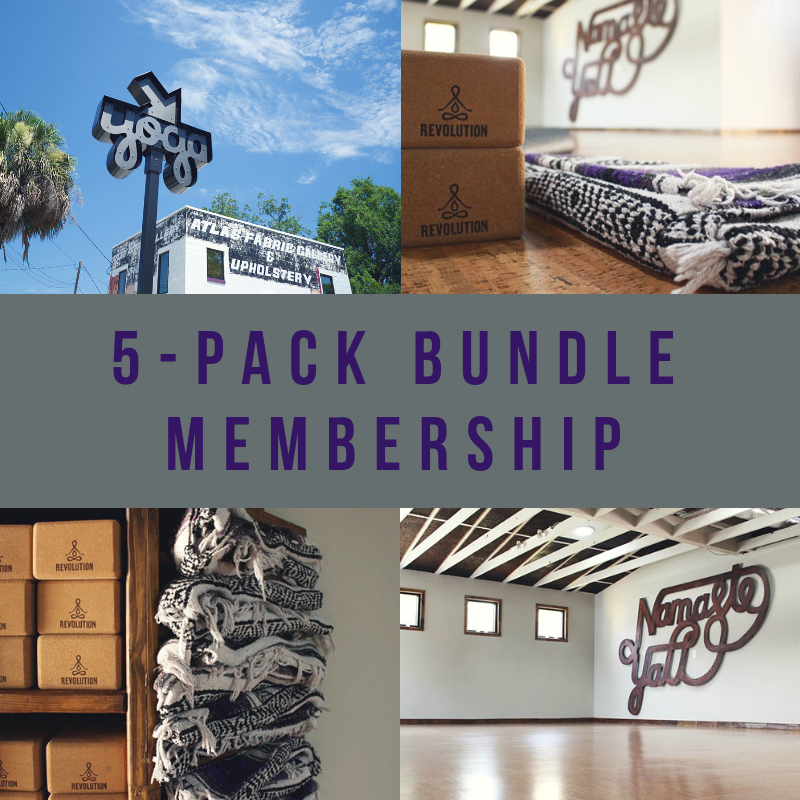 This package drops the class cost down to $8.25 and includes: unlimited yoga, discounted in-house workshops (5%), discounted retail (10%), 1 free guest pass per quarter & discounted massage with Summer Foster! Please read our full terms and conditions. This package is perfect for this who don’t practice with us on a regular schedule, as it drops each class cost down to $15! $150 for 10 yoga classes with a 6-month expiration date. Unused classes can be rolled over one time per year for an additional fee of $25.00. Students, Seniors (60+), and Military receive 10% off; this discount is only available in studio and ID is required. Please read our full terms and conditions. Good for one regularly scheduled yoga class. If you are a student, school teacher (grades K-12), Military, Senior (60+), first responder, or ride your bike/skateboard/hover board OR walk/run to class you may purchase a drop in class at the studio for a discounted rate of $15. Alternate modes of transportation that support and preserve our environment are highly encouraged!